You thought your exams were bad. Clear pencil cases are nothing on what some students have to go through. In order "to prevent cheating", entrants in the army recruitment test in India have been made to strip down to their underwear. Over 1,000 men in India's Bihar state were made to strip for the exam, and take the entire hour-long exam wearing nothing but the pants they came in. The army said the measure was to "save time on checking so many students" for potential cheat-aids (phones, notes etc). Anyone who refused to do this was not allowed to enter the exam. Image via the Indian Express showing the "undignified" examination. Officials said 1,159 candidates participated in the hour-long written examination on Sunday. "As we entered Chakkar Maidan, the venue, we were asked to remove all clothes except underwear. We had no option but to comply with the instructions even though it felt odd. The gap between candidates was about eight feet in all directions," one candidate said. Another candidate said that he thought the methods used to prevent cheating were "not dignified". Bihar and many other parts of northern India are notorious for cheating during examinations - last year parents and friends were photographed climbing school walls to pass on answers to school students. 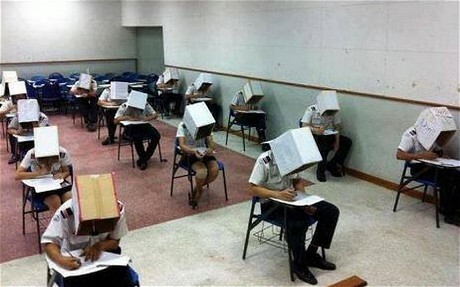 In January, the state announced fines and jail terms to stop cheating in exams. Stripping students down to their underwear may not even be the weirdest method that examiners have used to prevent cheating. 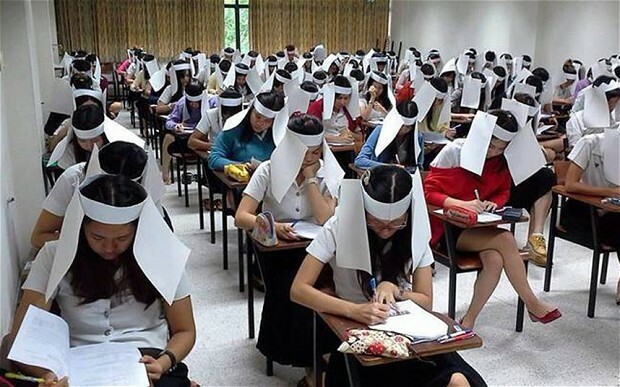 In 2013 in Thailand students were made to wear "anti-cheating helmets" in order to prevent cheating, made of paper and cardboard.